The calendar view is the most prominent part of Lightning. Users have direct access to several panes. A Month Pane containing a control called Mini Month for providing an overview about a whole month. 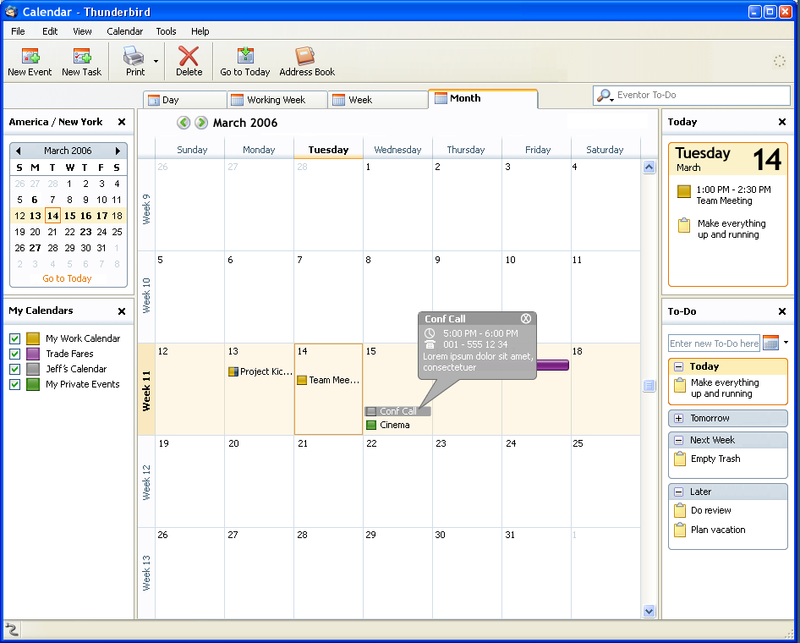 The Calendar Subscription Pane gives users an overview about calendar subscriptions and about users own calendar(s). The Agenda Pane provides a cumulative view of To-Dos & Events for the current day. The To-Do Pane lists the To-Dos of today, the upcoming days & weeks. Figure 2 gives an impression how the Calendar could look like. Details of each pane, and other window elements are described in detail in the sections below. The figure below shall provide an overview where each pane is located. 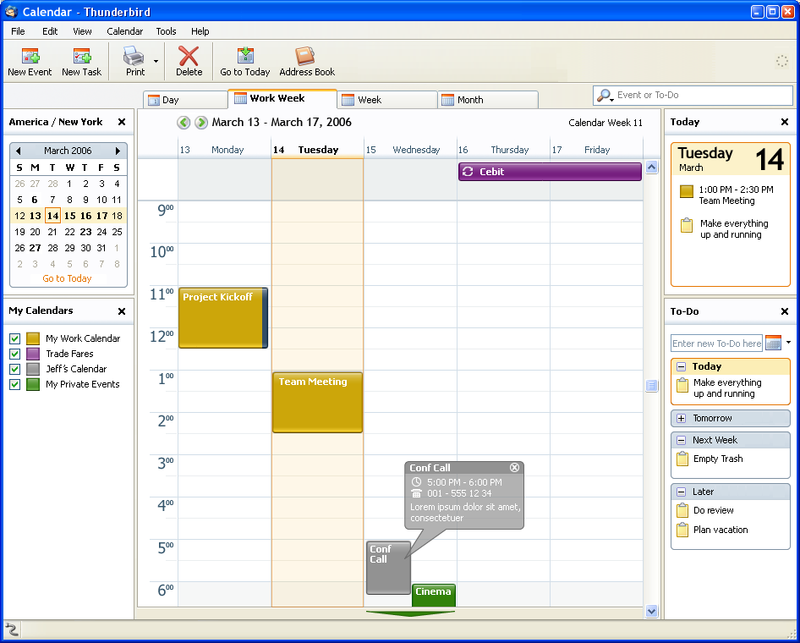 The Calendar View provides a dynamic layout, thus each pane can be scaled in size. Each pane can be closed. 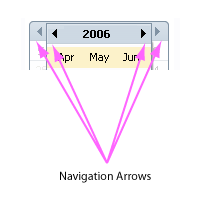 This applies not to the main Calendar Pane. Resizing the Mini Month Pane shows up additional Mini Months. e.g: "Mon, Tue, Wed, Thu, Fri, Sat, Sun" or "Sun, Mon, Tue, Wed, Thu, Fri, Sat"
The control should not change its size while switching between months. In general the mini month and the calendar views should run in sync. For example, if the user changes the month from May to June in the Calendar View the Mini Month should reflect that change. The only exception are four buttons. These are located in the upper left and right of the Mini Month and are intended to preview month. Given that changing the Month from May to June by using the Navigation wouldn't have any effect on the Calendar View. 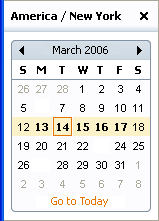 The date range displayed in the Calendar View (Day, Week, Working Week, Month) should be highlighted in the Mini Month. In Calendars Day View: The corresponding Mini Month day needs to be highlighted. In Calendars Week View: The corresponding days of the Mini Month week needs to be highlighted. In Calendars Working Week View: The corresponding days of the Mini Month working week needs to be highlighted. In Calendars Month View: The corresponding days of the Mini Month month needs to be highlighted. Clicking the Mini Month "Go To Today" button selects the current day in the Mini Month and chages the view in the calendar to the current date. Selecting one explicit Day, Week, Working Week, Month, Year should change the date range displayed in the Calendar View. The Year Panel can be reached by clicking the Month & Year area of the Mini Month. The panel allows users to navigate from one year to another by using the left or right buttons. In addition it should be possible to navigate quickly to a specific month within the next 12 month from the current month on. The panel should indicate month which relate to the previous or the next year differently. The figure below shows a proposal of the Year Panel. The Calendar Subscription Pane lists all subscribed calendars. Subscribed calendars can be stored locally or remotely. The graphical representation should be in both cases the same. Creation and the subscription of calendars shaould also be intergrated into the menus & maybe in the tool bar. 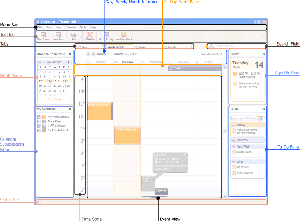 The figure below gives a more detailed impression of the features set which is needed for creating, subscribing, and publishing calendars. This page was last modified on 28 June 2007, at 13:15.